It can be a constant struggle to care for your loved ones and also maintain your professionalism, too. Currently, it’s estimated that one in five workers in the U.S. is responsible for elder care. Those in the “sandwich generation” are caring not only for their older loved ones, but for their younger children, too. The stats for caregivers are sobering: Among employed caregivers who are not self-employed, only half say their employer offers flexible work hours (53%) or paid sick days (52%). And fewer working caregivers say their employers offer employee assistance programs (23%) or telecommuting (22%). It doesn’t stop there—6 in 10 caregivers report that caregiving has resulted in their cutting back on their working hours, taking a leave of absence, receiving a warning about performance or attendance, or having other such impacts. Higher-hour caregivers are more likely to report experiencing nearly all of these work impacts. 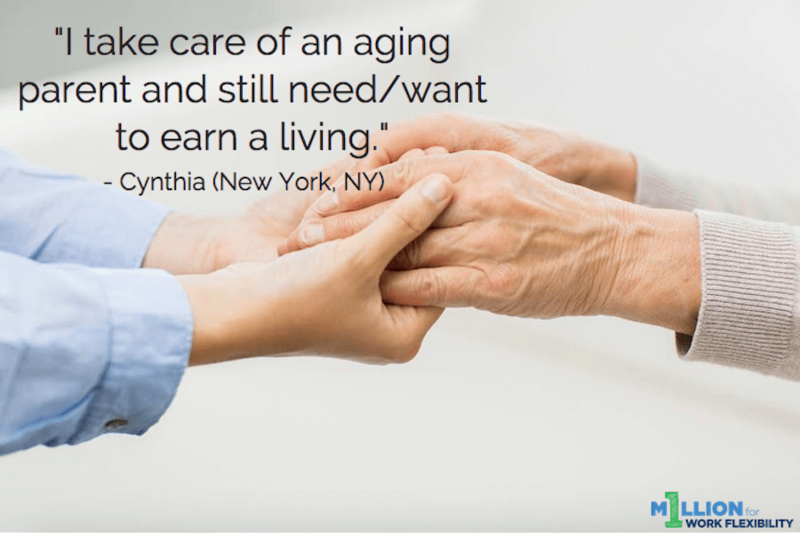 For caregivers of those old and young, here’s why work flexibility is an absolute must. To alleviate the pressure of the sandwich generation. Caring for an older loved one (such as a parent or other family member) and also having to care for younger children, too, is hard enough without having to go into an office and work a full-time job as well. To help people care better for their loved ones. If you’re struggling to stay on top of your workload and still provide quality care for your loved ones, something is going to give if you don’t have the flexibility you need. To allow workers to focus on what matters most. Sure, it’s important to be able to bring home a paycheck, but it’s also equally (if not more) important to be able to be a good caregiver. To give workers a choice. When you’re a caregiver, you sometimes need to make hard choices about your job in order to be able to care for your loved ones. In some cases, that might mean quitting altogether. That’s why work flexibility can help bridge the gap between being able to bring home the bacon and still be able to care for your loved ones—on your terms. Work flexibility can greatly reduce the stress currently placed on caregivers, allowing them to be the professionals they want to be, earn an income, and still be a caregiver to those they love.